“Go ahead! Put me in a cell. Lock me up! I’m sick of being hungry and cold. Sick of freight trains. 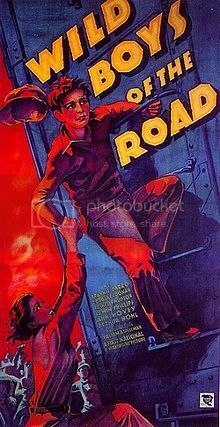 Jail can’t be any worse than the street.” A gritty, stark pre-Code drama from Warner Brothers directed by William A. Wellman (The Public Enemy), Wild Boys of the Road was based on a story by Daniel Ahearn called “Desperate Youth.” Faced with rapidly diminishing prospects at home, two desperate teenagers, “Eddie” (Frankie Darro) and “Tommy” (Edwin Phillips), set out on the road during the Great Depression and join a gang of other young hobos riding the rails seeking opportunity in the North. They get much more than they bargained for such as enduring brutal beatings at the hands of freight yard goons, eking out an existence at a squalid hobo camp (“Sewer Pipe City”) and—rather symbolically—ending up in the New York City Municipal Dump. In addition, a brakeman rapes one of the girls in the gang and Tommy has his leg amputated after he gets it mangled by a train. The tagline screamed, “Girls living like boys! Boys living like savages!” The solid cast includes Sterling Holloway, Minna Gombell, Grant Mitchell, Rochelle Hudson, Dorothy Coonan (who later married Wellman) and Ward Bond. The film clocks in at just 68 minutes and there’s a “New Deal” happy ending tacked on, followed by what appears to be the first example of breakdancing in a film—Darro performing several backflips followed by an amazing headspin. Don’t miss it!